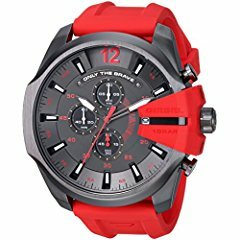 This handsome watch for men, features a red silicone wristband, that fits about an 8-11 inch wrist. The bright color will attract others to admire the gunmetal watch face. It's a big watch face so you can see the time with ease. The quartz movement guarantees precision timing. And it is water proof to 330 feet, which is excellent for swimming or snorkeling. No recommended for diving. The look itself is high-end. Easily as admirable as Rolex or Omega watches. It does feature a stopwatch function. And there are 3 time trackers including 0.1 seconds, seconds and minutes. There is an unusual red silicone piece at the side of the watch that appears to be purely decorative. This watch would be appreciated more for the younger gentleman than the older, as the gunmetal, red and black are sure to catch looks! The watch is a real keeper! You can purchase it here. It retails for $240.00, and free shipping is offered. I give this gorgeous watch five stars. And I am proud to offer it my personal highly recommended award. ****DISCLAIMER: This watch was provided by Amazon Vine in exchange of a fair and impartial review. All opinions on the item above are solely those of the author of this blog.